Lectronix has used our expertise in automotive electronics to construct some of the world’s most innovative police vehicle control systems. These products have focused on simplifying the challenging operating environment in police vehicles. Featuring technologies such as voice recognition, touch screen displays, hand controllers, and exceptional user interface design, these systems have won accolades and are in use by some of the largest police departments in the world. What began as a technology challenge has turned into a true passion for making police cars better. Public safety is of paramount concern to everyone, and we believe our systems make a hard job more manageable for officers on patrol and help keep them always connected. If you are a police fleet facing challenges dealing with the equipment needs of your vehicles, we would love to hear from you and share our experiences. If you are a Ford Interceptor user, we highly recommend you consider our ICS in-dash display and control system which is sold through our partner and distributor, Havis Inc. And if you are a current user of our products and want to talk, we always appreciate feedback. Introducing the Integrated Control System, available for the Ford Police Interceptor Sedan & the Ford Police Interceptor SUV. In partnership with Ford, Havis, and the LAPD, Lectronix developed the Integrated Control System (ICS) for Ford Police Interceptor vehicles. The Integrated Control System, which replaces a traditional mounting bracket and laptop with a 12.1″ touchscreen interface, consolidates communications equipment into an easy to use, customizable in-dash solution. Lectronix designs and manufactures the electronic components for the system which is distributed and sold by Havis Inc. The Integrated Control System combines cutting-edge, on-board technology, the convenience of touch control, and increased space to provide police officers with a comfortable, safe and connected solution in their cockpit. This highly integrated and customizable control system also creates a more efficient work environment. Vehicle Integration: The Integrated Control System is designed to fit the Ford Police Interceptor Utility and Ford Police Interceptor Sedan dash without permanent modification. Retrofit can restore original OEM dash or leave the display. Safety: By relocating computers and video sources to the trunk, the Integrated Control System allows for a flush profile of the OEM dash and a clean cockpit. This ensures OEM safety systems are unobstructed and avoids airbag interference. Ergonomics: The placement and orientation of the Touch Screen Display achieve the ideal position for the driver’s and passenger’s health, comfort, efficiency and safety. Display Visibility and Durability: The ultra-wide viewing angle of the sunlight readable LCD Touch Screen Display gives the driver or passenger full control of the system. It is composed of chemically strengthened glass that can withstand impact without chipping. The ICS is a rugged Android system that is connected to the vehicle and supports interfaces to a wide mix of common police equipment. At a push of a button the ICS becomes the display for other video sources in the car including laptop Windows PC, video recording, or backup camera systems. The on-board Android platform provides flexibility for today and the future. Mobile applications can run directly on the on-board Android platform, or run on attached computing devices that use the ICS as a display. In addition to being the safest and cleanest mounting for legacy MDC applications, the audio, video, and control interfaces can simplify the overall vehicle installation by routing and prioritizing audio sources, consolidating displays, and providing touch and steering wheel controls for installed equipment. Lectronix is ready to help with agencies looking to utilize the flexible architecture to it’s fullest potential, so contact us and let’s work together to design an optimal solution for your fleet! The airbag deployment zones for all modern police vehicles make traditional mounting of computers and equipment a difficult problem with only compromised solutions. The ICS completely resolves concerns over airbag deployment zones and allows the vehicle safety systems to operate without impediment. Officers also appreciate the additional space and freedom of movement within the vehicle this mounting achieves. In addition, with the in-dash mounting the ICS gains direct access to the Ford factory audio, video, and vehicle data interfaces, so things like speakers, microphones, camera, and steering wheel controls, all work seamlessly with the mix of equipment needed to complete a road-ready police vehicle. The ICS is available for sale through Havis Inc. and their extensive network of resellers. The system can also be ordered as a ship-thru option as part of the Ford vehicle purchase. Visit Havis for more information and purchasing information on the Integrated Control System. Watch Lectronix’s Jeff Judit give an overview of the Integrated Control System by Lectronix, exclusively distributed by Havis. The P7000 Integrated Police System provides an all-in-one computer and control solution for departments desiring to completely do away with extraneous controls and displays in the cockpits of their vehicles. 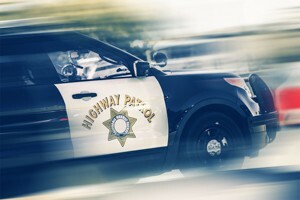 The P7000 was initially developed in response to a request from the California Highway Patrol for a Consolidated Police Vehicle Environment (CPVE). The State of California worked for years evaluating technologies and developing the requirements of their ideal solution. One goal of the ambitious program was to reign in the complexity and clutter of equipment in highway patrol cars. The resulting solution was specified from the ground up by experienced patrolmen to provide an optimized operational environment focused on officer safety. The P7000 consolidates controls into a single touchscreen display, an innovative hand control device, intuitive voice control commands and a robust keyboard for manual input. Every device in the vehicle including radios, MDC, traffic radar, scanners, lights, siren, and gun locks are all accessed through the integrated system. An additional key goal of this program was to solve communications interoperability across multiple radios. With P7000, the officer can easily select radios or set up crosspatches to instantly connect with other first responders. Lectronix worked on the California and other initial P7000 programs in close partnership with Rockwell Collins. Lectronix provided all of the core electronics and software while the Rockwell Collins team worked extensively on specifications, system integration, test, contracting, and sales and marketing. The product was marketed by Rockwell Collins as the iForce(tm) system. The resulting technology from the development of the P7000 has set the standard for the “police car of the future” and is available for agencies seeking to improve the safety, ergonomics and functionality of their vehicles. Traffic Radar The control head normally located on the dashboard is eliminated. The system provides a continuous display of all radar sensor information and allows controls via touchscreen, voice, or hand controller. Software support for common radar sensors from Stalker, MPH, and Kustom is provided. MDC (Windows PC) The system provides a complete Windows computer equivalent to the traditional police car laptop. The computer can be viewed in a “windowed” mode (leaves other information such as radar visible) or “full-screen” mode for optimal viewing. Radio Support Up to 4 mobile radios from various manufacturers are supported. The officer typically tunes by selection of geographic area and channel type and does not need awareness of detailed radio information. A configuration file describing the areas and RF channels is uploaded into the system from a USB stick. Radio Control Radio controls are operated by voice, touchscreen, or hand control device. The user can enable listening on any of the four radios, with one of the four selected for “talk” when the push-to-talk control is activated. Radio Crosspatch Crosspatching ties multiple radios together such that reception on one radio will be repeated on the other(s). The crosspatch configurations can be created on-the-go, or saved to USB and copied to other cars. Audio Configuration Extensive configuration of the audio can be accomplished through in car setup screens. Audio sources can be assigned relative priority and volume. Which speaker each source is played on can be configured. Configurations can be exported to USB and loaded on other cars. Audio Processing Volume levels can be adjusted individually for every device connected to the system. An integrated digital signal processor (DSP) is used for mixing, routing, and adjusting all audio inputs and outputs. Voice Controls All system functions can be mapped to a voice command. The end user can select the specific voice commands through the system configuration utility. Voice Interface to the MDC Certain voice commands can be passed through to the MDC (Windows PC) processor and handled by the end user’s dispatch and records management software. For example, license plate queries can be spoken via voice command and then submitted for wants and warrants lookup by the MDC. Lights and Siren modes The end user can activate response modes such as “CODE 1” or “CODE 3” via voice, touchscreen, or hand control device. These modes can enforce other agency policies such as turning off the AM/FM radio during emergency response. Administrator Mode The system requires an administrator login to access the system configuration screens thereby preventing unintentional misconfiguration by end users. Event Logging Because all equipment and the vehicle itself is connected through the P7000 system, a complete event log can be maintained. From incoming/outgoing radio communications, to button presses, mode activations, and car door openings, all events are timestamped with a high-resolution timer and saved for later export to USB. Memo Recording At any point the user may press and hold a memo button and record through the handsfree microphone. Recorded memos can be reviewed in car or exported over USB. Lights Out Mode For stealth situations “lights out” eliminates all audio sources and lights. Even the USB keyboard backlighting is eliminated. Video System Instead of having a separate display for the police recording system, P7000 allows the video to be displayed on the MFD with touchscreen or voice controls of the operation. Power Control and Standby When the vehicle is shutdown, the system can maintain low-power standby states for a period of time to avoid having to completely repower all equipment and log back in to the MDC computer.